Commissioned by RICAGV and designed by RI artist LeeAnn Herreid, these one-of-a-kind necklaces make a lovely gift for any occasion. 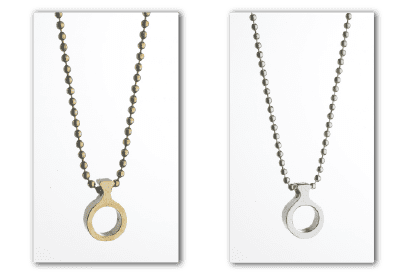 The Gun Barrel Necklace was the winner of our 2018 DANGERR design competition. They are made from the barrel of a disassembled handgun that was acquired from a buy-back program and proceeds from your purchase will support One Gun Gone, a gun amnesty/buy-back program organized by artist Scott Lapham. Secure, online payment with major credit card or PayPal account.